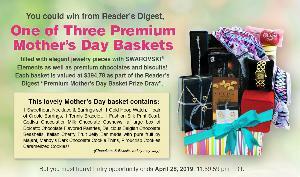 Prize: 3 Winners - Each winner will receive a Premium Mother’s Day Basket which will include tasty chocolates, cookies, a scarf and fabulous jewelry, for a total value of $394.78 each. Statistics: This contest was opened by 120 and entered by 31 ContestChest.com members. 26% of those who opened the contest, entered it.